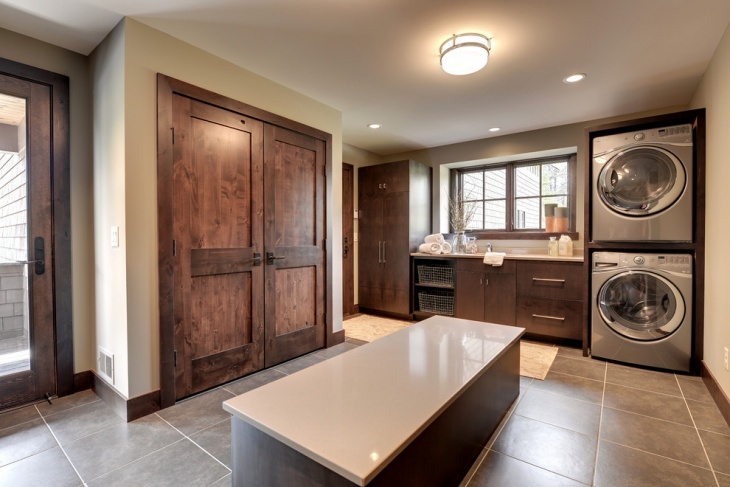 The laundry room in your home needs to be personalized according to your aptitude and choice. 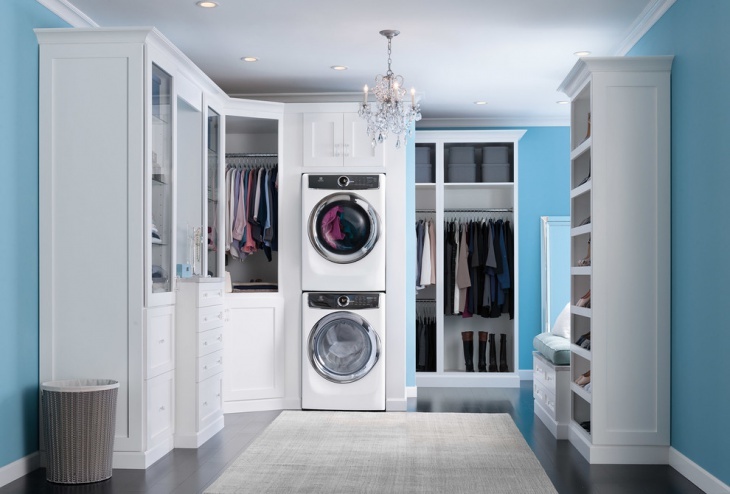 Generally, they consist of an automatic washing machine, a suitably-sized tub to wash various articles and a dryer. 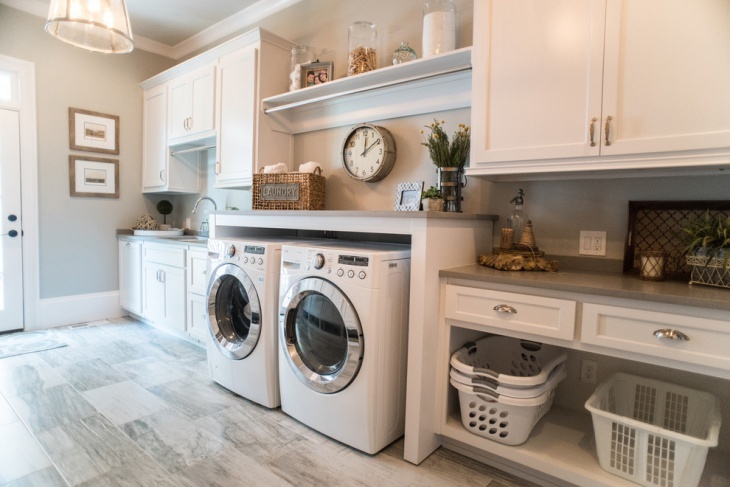 Individuals have different needs and tastes, thus, you will find a lot of innovative ideas when it comes to planning a laundry room. 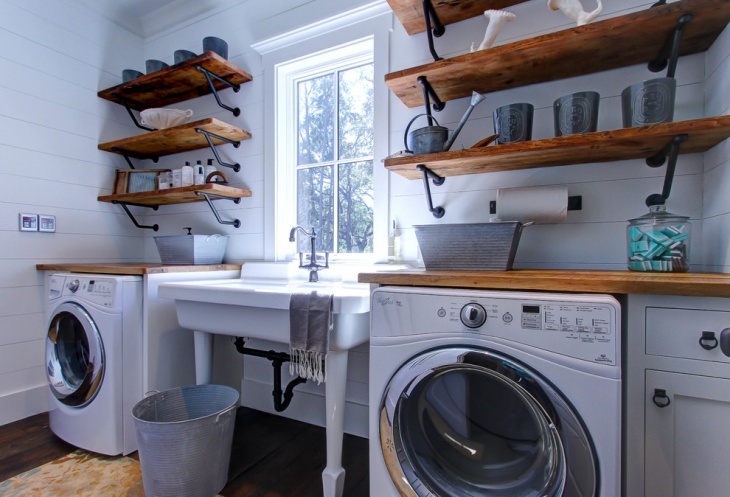 Here are ten classy laundry room ideas that you will find catering to your standards. 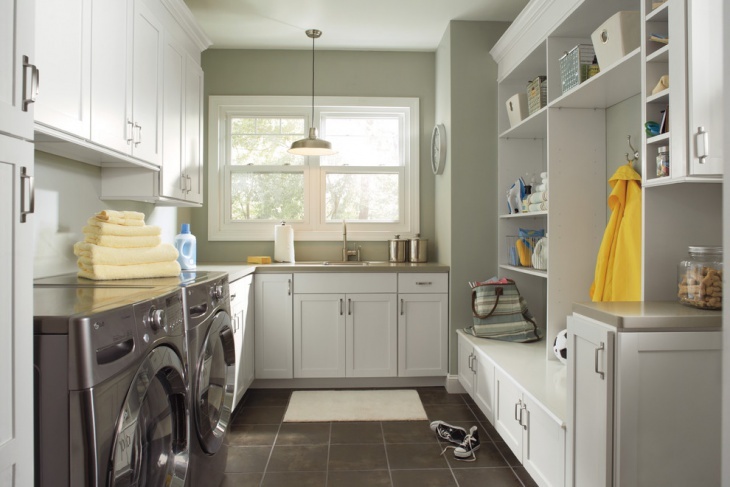 When you crave for a spacious laundry room, you can opt for this particular design. With beautiful walls and interiors, you can choose brown or gray tiles for the floor and white walls. 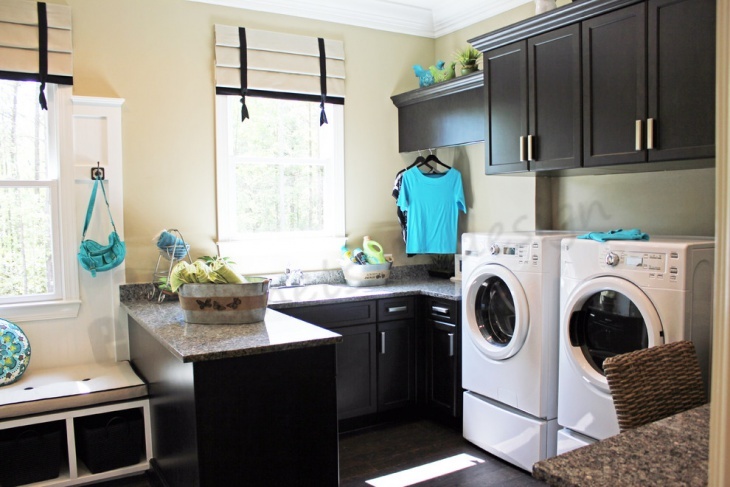 Paint the cabinets white and place the washing machines on the parallel walls. 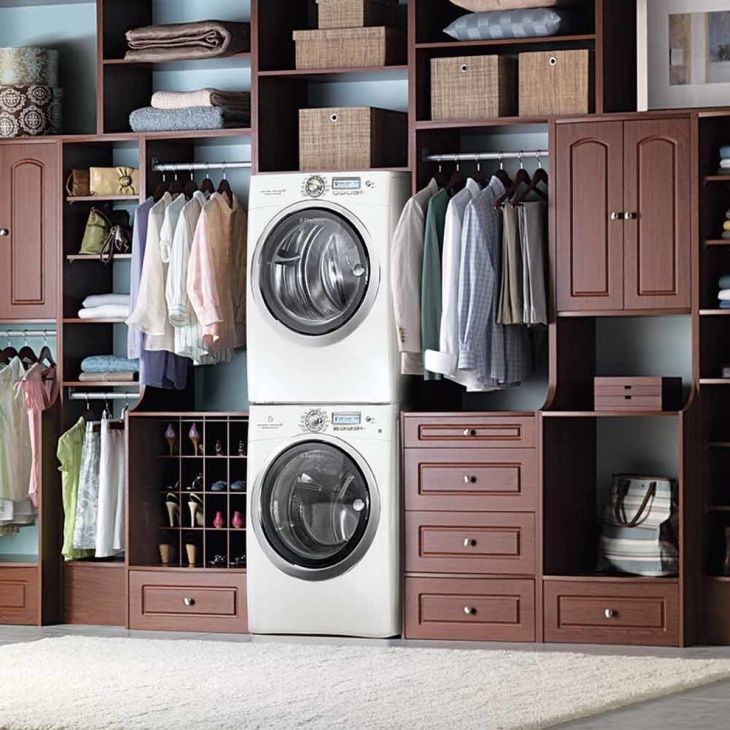 If you have a little space for the laundry, you can choose this setting. 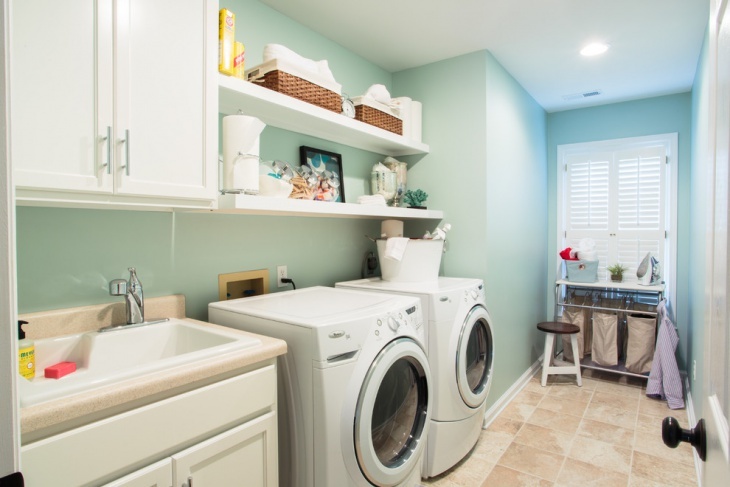 The Purple Laundry Room is compact with beautiful walls and cream colored wardrobe. 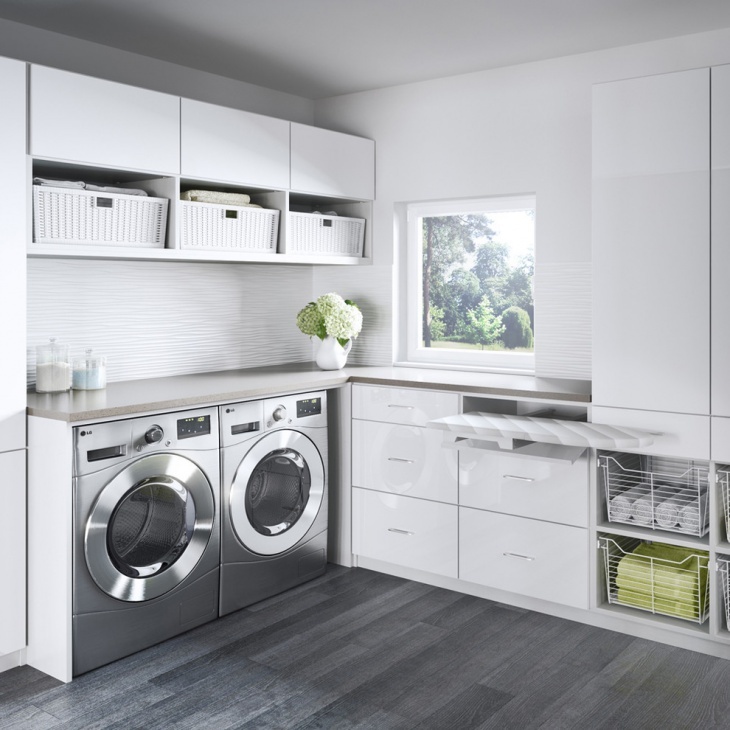 Place the washing machines one above the other to make the maximum use of space. Hang a mirror on the wall to make the look conspicuous. 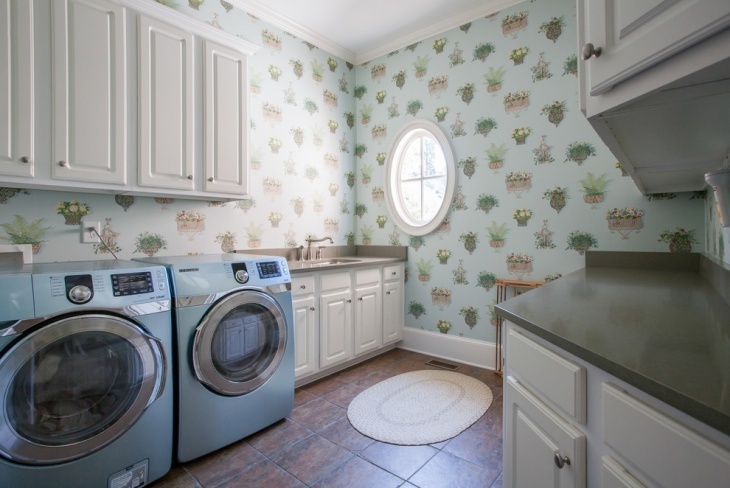 There are rugs for the laundry rooms with fashionable designs on them. All you need to do is customize them according to the color of the walls, floor, and cabinets. Red and yellow is a good combination that goes with pink walls. 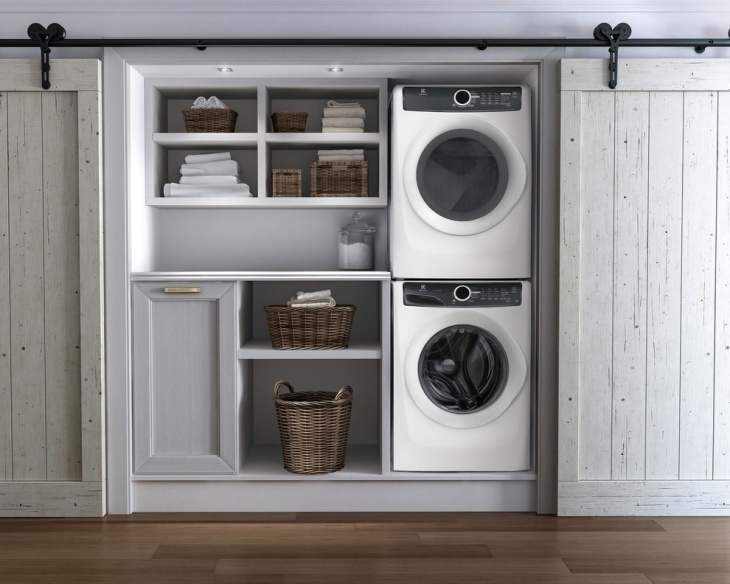 This setting can be wisely used to create a compact yet good looking laundry room storage. 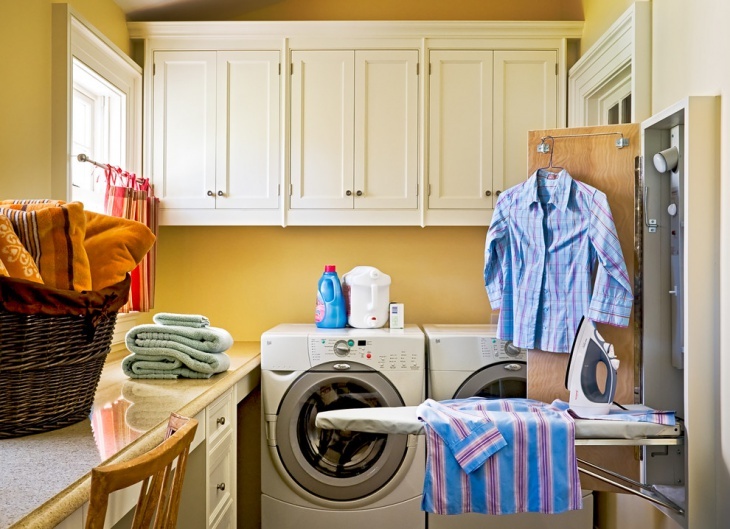 The spaces between the racks and the washing machines can be judiciously used to create optimum utility of space. Paint the entire rack dark brown, and this will be a good match with the light blue background of the room. 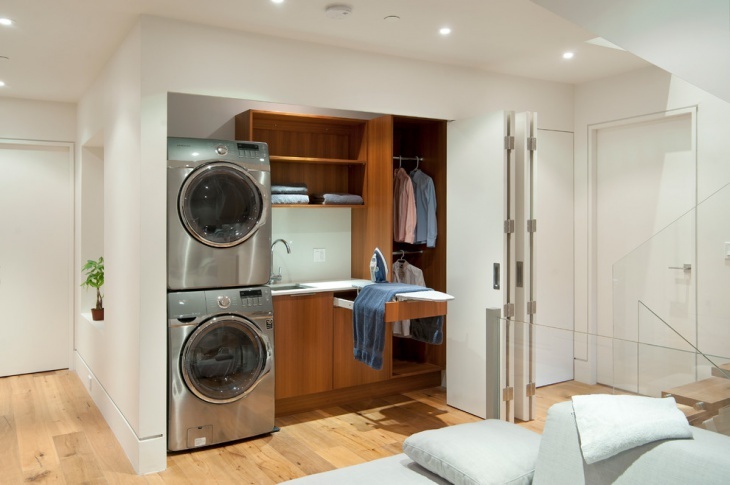 When you have a really big laundry room, the best option is to place the racks and the washing machine on the parallel walls of the rooms. Paint the walls in spotless white to bring about the ultimate sophistication. Grey floor tiles will complete the beauty. 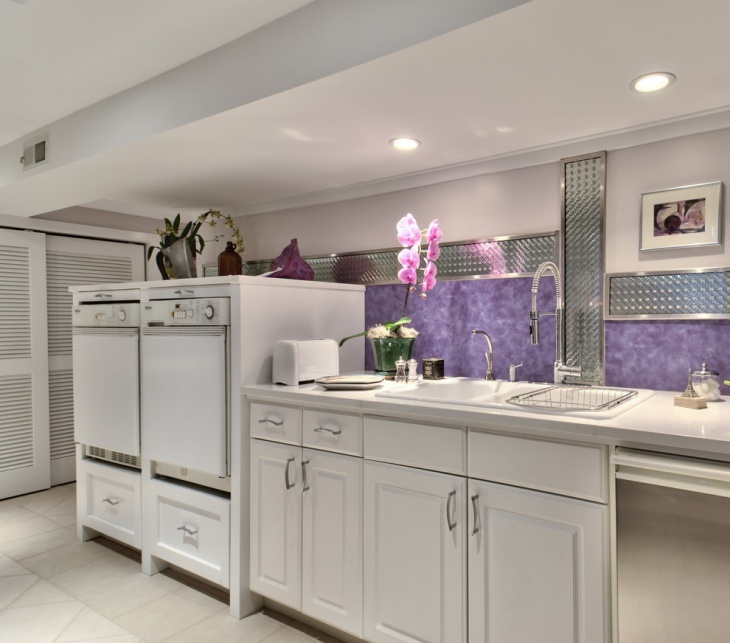 Place the sink elegantly on the cabinet for the best looks. Paint the room white along with the cabinets and shelves. To yield an appealing beauty, place a flower vase beside the sink. 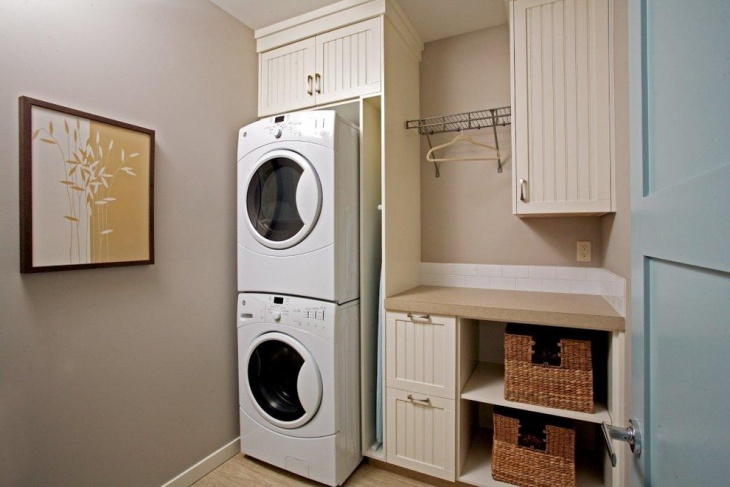 In an adjacent position, keep the washing machines beside each other. 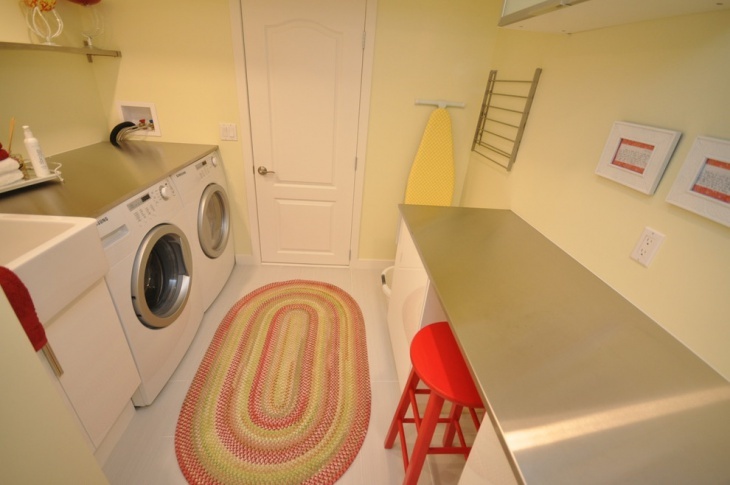 The floors of the laundry rooms deserve special attention. Use marble tiles to pave the floors. The color of the tiles must complement that of the walls and other accessories. The pink color goes well for this purpose. 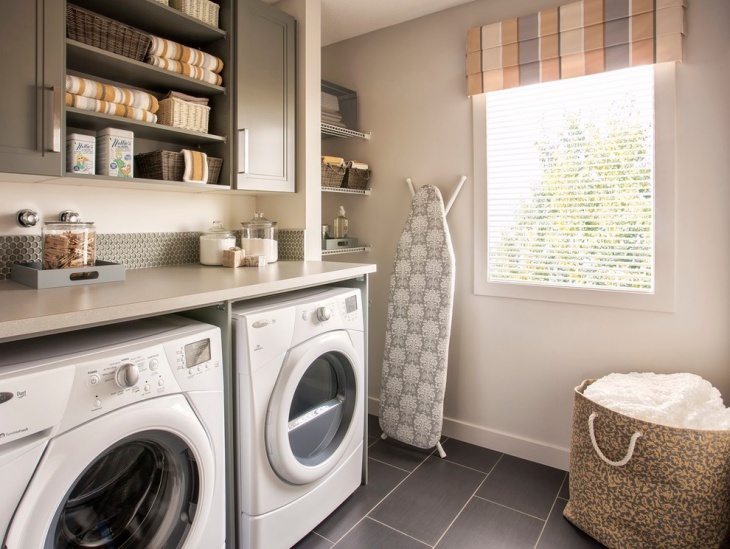 When you want to accommodate the Laundry Room Accessories in a compact area, you can avail this seamless setting. Use wrought iron supports for the wooden planks, placed one above the other in two rows. Place the accessories over it, and the wood finish of the decks will really look charming. 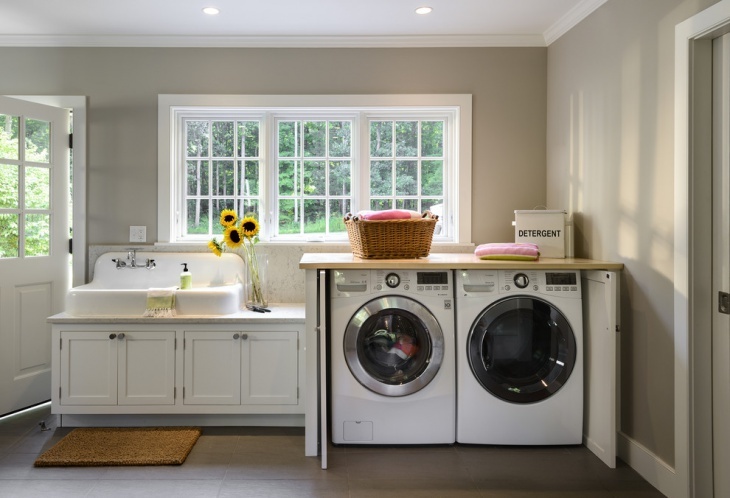 The windows of the laundry room can be elegantly covered up with a matching material. The lighter shades like white and pink are recommended for the best looks. This will allow the light to stream in unhindered, and this will boost up the looks of the room. 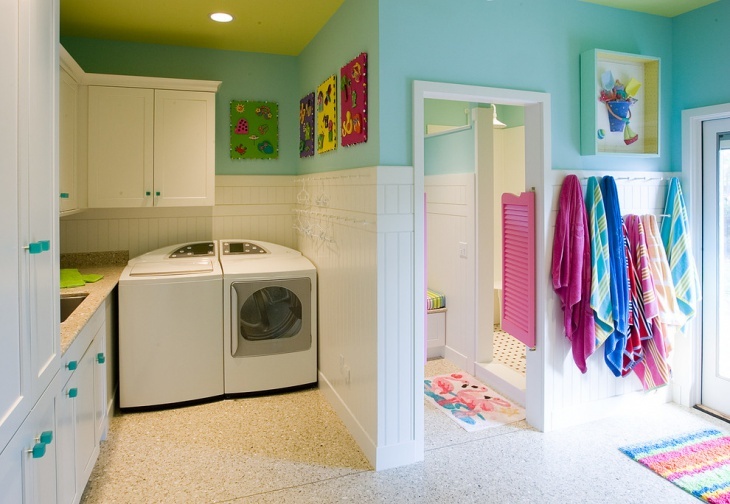 The laundry room can be made spacious by allocating a special area adjacent to the bathroom. Hang the clothes from the hooks on the walls. Make sure that the lower areas of the walls have tiles, beautifully complementing the blue upper walls. 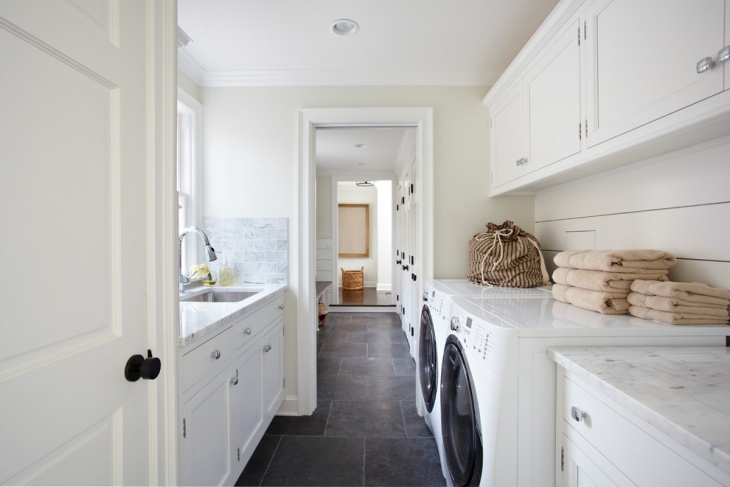 Elegance and utility need to find a balance when you plan the settings in the laundry room. Use the vibrant colors on the walls to make the beauty more pronounced. With all these ideas, you may incorporate something really charming.